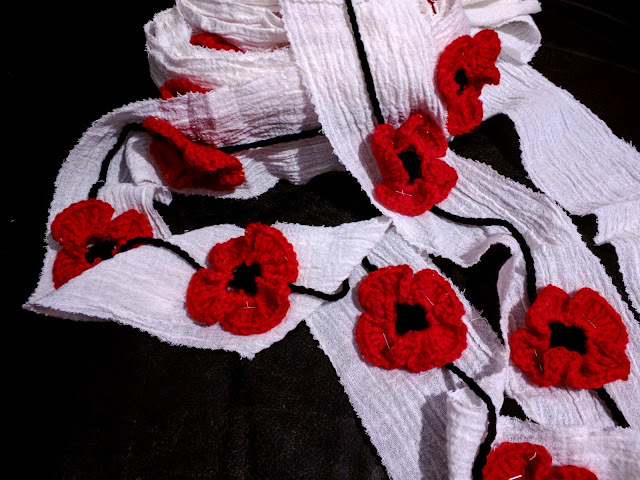 This Crochet Poppy Garland is designed to be worked up quickly for bulk poppy making and yarn bomb projects. Using a SC, Join yarn anywhere into the single crochet stitches of row 2. **Ch 3 skip a stitch of previous row and SC into next stitch repeat from ** 3 times leaving off the last SC, instead SS to first SC of row. Repeat from *** 3 more times, SS to finish. Work over red yarn end as you go to minimise weaving in. Back your garland with fabric for extra visibility. This poppy garland pattern can be seen in the Z-Special tribute. I love this Stella! For remembrance, it's terrific. And looks easy! Especially stunning on the white back ground. The white background certainly helped to make it stand out. Easy and fast were the main priorities, I want to get some thicker yarn to try it with though. I hope to get back to making more before November...but I've got so many other projects on the go it might not happen.